The next wave of Transformers Power Core Combiners toys to be released in the US have just been spotted at Wal-Mart at Tulare, CA. The wave includes Icepick with Chainclaw, Leadfoot with Pinpoint and Sledge with Throttler. It’s been a big day for Transformers fans, with these silly little things joining Toys R Us exclusives Masterpiece Grimlock, Animated Rodimus Minor and Ironhide sightings just starting today as well! If you don’t do so already, check out the Sightings Forum, TFW2005’s official place to coordinate with other local fans and get hooked up with the toys on your want list! And I also want to plug a really helpful thread in our Transformers Toy Discussion forum, created by TFW Contributor thenatureboywoo. Check out his list of all the current and upcoming Transformers releases, right here! Thanks to Hye6640 for the photo evidence! TFW2005 member sannman was good enough to share a video clip and some photos from the set of TF3 earlier this week. He’s back with a series of clips from his vantage point near the set. It’s great stuff: a N.E.S.T. firefight, an army Striker unit, and of course, plenty of explosions! Continue reading to see all six clips! 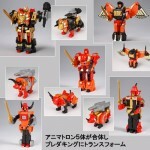 A preorder page for the Takara Tomy Predaking reissue has been found at Rakuten shop Robocris. The new photos give us a closer look at the combiner’s merged form as well as smaller shots of the individual Predacons in beast and robot mode. Notable is the new gold replacing the yellow of the original and the first reissue from a few years back, which especially looks nice on Razorclaw, Headstrong and Divebomb! Also, the preorder page names a release date of November 27. From the TFW Heads on a Stick desk, we bring you another image today from the Transformers 3 movie set. Thanks to our own on the scene photographer uruseiranma for what is in all likelihood Shockwave. Pointy ears? Check. Singular emotionless orb? Check. Discuss below! Who better than TFW2005 member Red Alert to give us an early sneak peek at the Generations version of Red Alert? Check out the whole gallery, including comparisons with the Henkei version of Alert, by hitting the title bar or the thumbnail. Red Alert has also shown us how nice this new Red looks with his partner in firefighting and old G1 pal Inferno! Over the last month or so, a giftset of ten Headmasters KO heads has surfaced on auction sites like iOffer and eBay, as well as in the TFW2005 Junkion Exchange. The giftset contains the six Japanese exclusive heads Kirk, Lione, Loafer, Rodney, Shuffler and Trizer. Rounding out the set are Fortress Maximus Spike, Grand Maximus Spike, Lord Zarak and Black Zarak! TFW Supporter and Kapow Toys owner Red leader has obtained one of these sets and has posted his feedback on them. He’s also included some comparison photos between this set’s Fortress Maximus Spike and a vintage version. Be aware that these KOs are on the market if you are looking to add these molds to your collection, so you can be more informed about what a seller is actually offering you. The Japanese exclusive molds on these KOs are missing the copyright stamps that appear on the vintage versions, so make sure to look for that if you are after the originals! Vangelus Previews Fansproject Protector at Botcon! So here I sit at Botcon 2010 and the Botcon 2011 website is already live! There is also a link to the Sheraton Pasedena website for room reservation booking, but right now it’s saying the block has been filled, which seems a little weird. Especially since I’m not hearing from anyone here who’s successfully booked. Anyway, check out the new page here! UPDATE: Reports are coming in that fans are having more success by calling the hotel directly to make the reservation. If you’re ready to book, maybe give that a shot! The Sheraton Pasadena number is (626) 449-4000.